CARBONDALE, Ill. – High school just doesn’t work for everyone, and not always for the reasons one might expect. Sometimes, a student’s desire to learn burns so brightly that it blots out everything else. Frustration – with the pace of instruction, with the social aspects, and the curriculum itself – can lead to troubles. No, high school just doesn’t work for everyone. Will Blankenship found that out about himself a few years ago, as he struggled to complete his high school requirements in his hometown of Springfield. First, he struggled at a local parochial high school, and then a public one. And when that didn’t quite work out either (despite being named an Illinois State Scholar), he turned to a self-paced online academy, completing three years of studies in just four months with an “A” average in all classes. And then that academy lost its accreditation. But for Blankenship, it was never about lack of motivation to learn. After the online academy fail, Blankenship quickly achieved his GED and during what should have been his senior year in high school, he started his own computer repair company: Will's Computer Repair. He moved to St. Louis, got a job working as a computer technician and thought about his future. And after eight months of doing computer repair full-time and programming in the evening as a hobby, he decided programming was what he wanted to do. He decided to pursue his interests at a place that took his dreams and goals seriously. He visited SIU’s Department of Computer Science, where he met Associate Professor Michelle M. Zhu. It was life-changing moment. Speaking at length with Zhu that day, Blankenship learned all about her research on specific types of computer clusters, software algorithms and the facilities that would be available to him – the impatient learner – even as an undergraduate. Zhu said she remembered Blankenship visiting the campus with his parents, Kristi Blankenship and Bill Blankenship of Springfield. 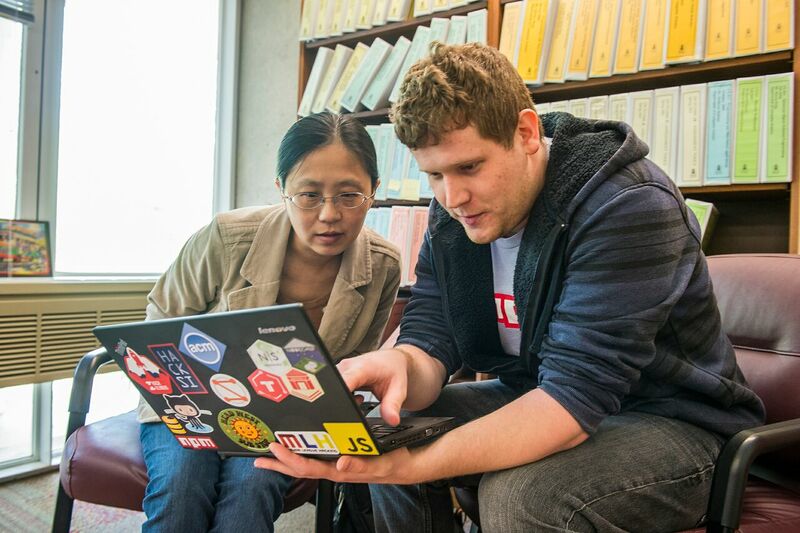 Impressed by his maturity and knowledge at such a young age, Zhu strongly encouraged Blankenship to pursue a computer science major. “I could see his future as a successful computer science professional with his curiosity and brilliance,” she said. Blankenship’s journey at SIU has been filled with achievement. During his freshman and sophomore years he had the opportunity to work as an intern at Boeing Co. In 2013, he competed for and won one of the just two sustainable Research Enriched Academic Challenge (REACH) grants, which support and encourage undergraduates to undertake independent research efforts in their field of study. Blankenship said SIU fed his ferocious appetite to learn and do research in his area of interest. He also worked with Zhu on an environmentally friendly computer cloud project aimed at reducing electricity consumption in computers by using novel job-scheduling algorithm in a data center. In his junior year, Blankenship served as director of the St. Louis Area Undergraduate Research Symposium, which brought students in the St Louis area to a research forum in Carbondale. The event played host to student researchers from universities such as Washington University, Saint Louis University and SIU Edwardsville. In his senior year, Blankenship served as chair of the SIU chapter of the Association of Computing Machinery, which helps organize student activities related to computing, including HackSI, an event focused on computer security. He also founded OpenSpace, a non-profit organization focused on promoting technology in the community. “Will is a quick learner and always seems energetic to explore new technologies that attract his interests,” Zhu said. With commencement looming, Blankenship said he has already secured employment with NodeSource, a technology company that offers consulting and training services for Fortune 500 companies and government organization.